Bay's bomb ends a rainy night in 13 innings! Jason Bay ended a long and dreary night in the rain at PNC Park with his 16th homer of the season to lift the Pirates to a 4-3 win in the 13th inning over Tampa Bay. The game was delayed 45 minutes in starting due to brutal thunderstorms in Pittsburgh that eventually found their way here. The rain never really left Steeltown as the game was played in conditions that were better suited to Heinz Field than PNC Park. Ty Taubenheim gave a more than credible effort in his first Pirate appearance as he lasted six innings and allowed just two runs on seven hits. Taubenheim was returned to Indianapolis after the game with the roster shuffling,but he pitched well enough to return for a second start next week. Taubenheim even added an RBI as his fifth inning double (that almost left the yard) scored Jose Bautista for a temporary 2-1 lead. Tampa tied the game in the sixth and that sent Taubenheim from the game and gives me the chance to comment on something that I have already gotten tired of seeing from John Russell and Jeff Andrews. I am not sure which of these two are making the decision to remove pitchers or if it is a joint call,but all too often the staff is going too long with mediocre hurlers that are basically five inning pitchers and trying to push them for extra innings. This usually results in negatives as any positives from the Dumatraits,Taubenheims etc often are washed away by simply asking too much from a pitcher that is over-performing to begin with. I know the bullpen is not much better,but still this needs to at least be looked at. Doug Mientkiewicz returned the lead to Pittsburgh in the seventh when his pinch hit double scored Adam LaRoche. But Damaso Marte could not hold the lead when in a 15 pitch at bat,the Rays used a pinch hitter in Jonny Gomes to take Marte over the fence and tie the game until Bay's heroics. Battlin Bob's favorite (Not really) John Van Benschoten picked up the win in relief for his first win of the season (1-2). The series will be decided at 1:35. Before the game,the Pirates recalled T.J. Beam and sent Nyjer Morgan back to the Hoosier state. This will be a continuing trend. Here is an interesting article on the not so secret secret on the Cleveland Indians moving their AAA farm club to Columbus from the jilted perspective of Buffalo. This is not a "Buffalo issue" as much as a long awaited chance to invade the neutral Ohio territory of Columbus and rid the area of casual Reds fans. More credit to the Frederick Keys,who not only gave away a limited edition team set to kids,but other items to all fans. I picked up a Keys pint glass to go with my Hagerstown Suns from last year. I really loved those glasses,so of course that promotion was not returned-Just my luck. Rachel grabbed a t-shirt,Ryan a bat (which he gave to Rachel,what a guy!) and Battlin Bob added a Keys cap. Great work by the Keys. A note to the guys in the Hagerstown Suns front office-I liked the sticker nights,but I would like a limited team set with completely different cards like the Keys even better! But make them for all fans,the one thing that I would change about the Keys card giveaway is that all fans should get one,not just 12 and under. With yet another visit from either Lakewood or Delmarva,the signing front has been kinda slow lately. Picking off a Hagerstown Sun here and there and the occasional Blue Claw or Shorebird has been about as good as it gets,but suddenly things became interesting-the Suns finally received their first major leaguer on a rehab assignment in Austin Kearns. Of course,this was touted as a reason that the Nationals wanted their SAL team here,but Potomac usually gets first dibs on the rehab assignments. Kearns was very nice,talked a little,if prompted and signed one item for everyone. More than fair and not a problem at all. I came away quite impressed with the Nationals flychaser. Other than that,not much new here in Hagerstown as both of the visiting teams do not have team sets out yet and that is a pet peeve. I cannot blame anyone,just a coincidence that Lakewood and Delmarva visit here so much,yet their team set has to be done in one series. And that is no different than the one visit teams. I did add the SAL top prospect set from the Suns team store and was able to add both Delmarva players in Tyler Henson and John Mariotti,who seemed kinda surprised to be in the set! I was able to get one of the Lakewood duo in Dominic Brown,who is the best player that I have seen here this season. Apologies to Mike,who prefers Greensboro's Osvaldo Martinez as his top choice. Last night on a hot and crowded night in Frederick,I did very well working on the Kinston Indians as I was able to get every player there except for one-a non-prospect that did not seem all that interested in signing for anyone. I was able to talk a little bit with my favorite players in the Indians organization-outfielder Nick Weglarz and pitcher Josh Tomlin. Weglarz chatted about his recent appearance on Indians minor league magazine on Sports Time Ohio and his adjustment to the Carolina League. Nick also is a member of my minor league fantasy baseball team and has quite a future ahead of him in Cleveland. I talked to Tomlin about Texas Tech baseball (he attended there),but he had to cut things a bit shorter than usual. Josh always calls me sir,which shows me two things. His parents did a great job raising him and I am getting old! Other prospects of note that signed their K-Tribe cards were SS Carlos Rivero,1b Beau Mills,2b Jared Goedart and pitchers Hector Rondon and Neil Wagner. Very good day,but we left after a half inning in a very unusual move for us. Temps in the mid 90's that made me borderline sick and a huge Frederick crowd that made it difficult to see. So we went home before the thunderstorm hit and watched the Pirates. The game was shortened by rain,but Tomlin went all the way in a 3-0 win. Until next time,when the only interleague game left is the makeup game with the Yankees and we are one day closer to some new teams finally coming to the Muni! Bad day yesterday as the PC was down here at the world headquarters and with my limited abilities,it looked like it could be new PC time and therefore fewer dollars in the vault. But the highly valued skills of Ryan came to the rescue and turned things around for us. Thanks to him for that! The Pirates were rained out against the Yankees on Thursday,so we didn't really miss much there,but last night were routed by the Tampa Bay Rays 10-5. Jimmy Barthmaier (0-1) was ripped in his one day stint in the bigs for seven runs in two and a third innings and was shipped back to Indianapolis in favor of Ty Taubenheim. Taubenheim will be the next contestant on You really want to be a Major League Pitcher? Not much to say about this one other than Freddy Sanchez hit his fifth homer of the season. I missed the game,spent a lot of time in bed listening to the cool thundershowers that hit the area. Tampa continues their visit tonight at 7. Expect the rotating rotation to continue as Ian Snell's sore elbow that was going to miss one start wound up putting him on the 15 day disabled list with Phil Dumatrait. I can never figure out why these things always seem to drag out. Snell's DL assignment freed up a spot for newly acquired Denny Bautista,who lasted three batters before being forced from the game when a line drive hit him in the arm. T.J.Beam was sent down to Indianapolis to make room for Barthmaier,who was then sent down for Taubenheim,who could be sent down to clear a spot for John Van Benschoten. Pay your dime and watch the carousel go round,kids. Mildly surprised at the Cleveland Cavaliers pick of N.C.State's J.J. Hickson in round one with Kosta Koufos there for the taking. Hickson could be the burly rebounder the Cavaliers lost when Drew Gooden was peddled to the Bulls and may be a preview of a possible dealing of Anderson Varejio before the season begins. Going to the Frederick Keys-Kinston Indians game tonight,look for a on the signing front from there as well as the Austin Kearns rehab stop in Hagerstown tomorrow. The Pirates played two lopsided games with the New York Yankees since our last post and split both blowouts. On Tuesday,the Buccos managed to tiptoe through the minefield was Tom Gorzelanny's outing and walked away with a 12-5 win. Gorzelanny lasted six innings and earned the win (6-6) despite walking five Yankees,including pitcher Darrell Rasner TWICE and seeming to be in trouble in just about every inning. Fortunately,the offense picked him up banging out 19 hits and being paced by two homers by Ryan Doumit (10) and Jose Bautista (9). Bautista continued his recent power surge in interleague play and was one of four Pirates to finish with 2 RBI on the night. Doumit joined Freddy Sanchez and Adam LaRoche with three hits in the game as the offense really carried the day in this one. 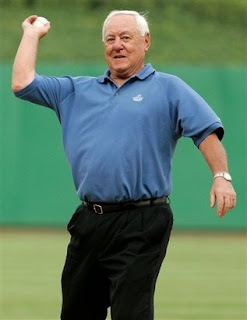 Hall of Famer Bill Mazeroski tossed out the ceremonial first pitch to commemorate the first return of the Highlanders to Pittsburgh since the famous World Series homer by Maz in 1960. The middle game of the set was not nearly as good for the black and gold as Joba Chamberlain and the Yanks completely shut down the Pirate offense and pounded Zach Duke (4-5) and his reliever T.J. Beam on the way to a 10-0 New York win. Duke lasted five innings allowing 4 runs (3 earned),but Beam allowed four more in just an inning and that put the game totally from reach. Jack Wilson went three for three in about the only Pittsburgh bright spot on offense. The series concludes tonight at 7. 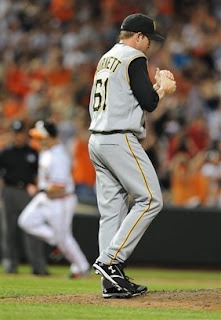 The Pirates will go with Jimmy Barthmaier to fill the rotation spot of Phil Dumatrait on Friday. Barthmeier will be making his major league debut after being claimed off waivers from Houston over the winter and has pitched at both Altoona and Indianapolis this season. No announcement on the replacement of Ian Snell for Saturday's start,but Battlin' Bob's favorite John Van Benschoten is the early frontrunner. The Pirates also added Denny Bautista to the bullpen from Detroit for Lynchburg righthander Kyle Pearson. Bautista's numbers look good,but he ran into a numbers game in the Motor City and was therefore available. However,in the Post-Gazette,a scout was quoted as Bautista being a "Tyler Yates type guy". Frankly,I am not that enthralled with the original Yates. This is the fifth stop for the righthander,so there may be something to that comparison! One of three guys will have to go to make room for Bautista-Sean Burnett,Franquelis Osoria or T.J. Beam. Beam can be returned to AAA Indianapolis,but Burnett can declare free agency if they attempt to send him down and Osoria must clear waivers. Beam seems like the most likely due to the ease of shipping him down compared to the others. Sorry to lose Pearson,despite his pedestrian numbers for personal reasons. Pearson was a nice guy that was always willing to talk a bit and during a game last season in Frederick,we sat next to his wife Courtney,who was a super nice person. Always tough to lose good guys,but maybe things will turn around for Kyle with the Tigers. And finally,a special tip of the hat to Lakewood first baseman Karl Bolt,who w as relentlessly heckled on Tuesday night and then blasted a game tying three run homer with the Blue Claws down to their final out. I especially liked Bolt's motion to this jerk as he ran up the first base line. I don't have a problem with rooting and some ribbing of players,but this guy rode Bolt all evening long and the look on this guys face after the longball was well worth the price of admission! The Suns won anyway in 12 innings,so the home crowd went home happy,but clearly that was the moment of the season thus far for me. Ian Snell did not pitch well and the news got worse as he was forced to undergo a MRI on his right elbow today after lasting just 4 innings in the Pirates 8-5 loss to Toronto. The Pirates fell behind in the first as Toronto scored 2 runs,but Jason Bay's ground out cut the lead to 2-1 after one. The Blue Jays added two more runs in the fourth,but the Pirates tied the game on a two run single by Jose Bautista and Raul Chavez followed up with another RBI single that got Snell off the hook as the pitcher of record. Newcomer T.J.Beam was the hard luck loser (0-1),as he walked a batter with one out in the sixth inning and was taken from the game in favor of the usually crappy Franquelis "Nitro" Osoria,who then now allowed the inherited runner to score,but added three more to the total. Why Osoria continues to be used so much when he pitches so poorly continues to be a major indictment of John Russell's tenure thus far. The Pirates added their final run in the sixth on a Luis Rivas ground out. Snell's MRI results looked encouraging (golfer's elbow) and he may only miss his scheduled start on Friday. The Yankees come to town tomorrow for three games. Phil Dumatrait also underwent an MRI and has bursitis in his rotator cuff. That is a minor problem and he will likely return after his disabled list term expires on July 5th. Battlin Bob is rejoicing as I write. The problem becomes this in the rotation. With today being an off day,the Pirates were going to be able to keep things normal until Saturday,but now with Snell out of his start on Friday,it looks like either two guys from Indianapolis or a waiver wire pickup will likely be making those starts. Ryan Doumit is expected to return to the lineup for the Yankee series behind the plate. John Russell made a dumb move in yesterday's game. With runners on base and no one out,Russell pinch hit for Snell. No problem there,considering the elbow issue,but he selected Freddy Sanchez to do so. A bit early,in my opinion,but OK. But then Sanchez is ordered to sacrifice bunt and resulted in a pop up to the catcher. Couldn't Russell have sent Snell up to move the runners over and then replaced him on the mound and therefore saving a pinch hitter? Or even picked another hitter to instead of Sanchez in order to have Freddy for later? In Saturday's big fight,Arthur Abraham left no controversy intact in knocking Edison Miranda down three times and finishing him off in the fourth round. Miranda won the first two rounds on our card,but Abraham began to turn the tide in the third before ending the fight in round four. An excellent outing for the IBF champ and looks to be possibly the next major test for Kelly Pavlik. The Pirates were only able to bang out five hits against Toronto pitching,but three left the yard and all three had a runner on base when they were hit,so the Pirates walked away with a 6-3 victory over the Blue Jays. Jason Bay gave the Pirates a lead that they would never surrender with a first inning homer (15) and Raul Chavez hit his first homer since Richard Nixon was President (just kidding) to give the Buccos all the runs that they would need. Jose Bautista would add some insurance runs with his 4th inning longball (8) to finalize the Pittsburgh runs for the evening. Bautista finished the night with 3 hits in as many at bats. Paul Maholm evened his record at 5-5 in earning the victory in a seven inning outing that he allowed all three runs in. John Grabow pitched a scoreless eighth and Matt Capps duplicated the feat in the ninth in picking up his 17th save. Toronto's big move was in the seventh,when they scored two runs to cut the score to 6-4,but Nate McLouth ended the inning by throwing Rod Barajas out at home plate. The Pirates will go for the sweep today at 1:35. 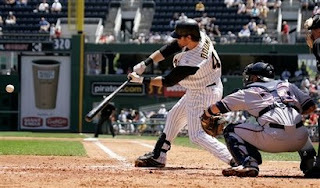 The Pirates placed Phil Dumatrait on the disabled list and added T.J.Beam from I ndianapolis. Dumatrait is listed as having left shoulder problems. Could it be that maybe his problems going past five innings were an injury issue? In event,Battlin Bob is now officially in mourning. Beam has been downright dominating for the Indians lately and deserves the callup. Check these numbers out-three earned runs in his last 22 1/3 innings and a 2.02 ERA on the season. The 27 year old Beam will have to be placed on the 40 man roster,so someone will have to be taken off the 40 man or placed on the 60 day disabled list. No idea on who will replace Dumatrait in the rotation,but the only alternatives that I see are either John Van Benschoten or Bryan Bullington from Indianapolis. Looks like Terrelle Pryor's decision to attend Ohio State means the end of the line for Antonio Henton. Henton has decided to transfer to 1-AA Georgia Southern and be eligible to play immediately for his home state Eagles. Henton is the second quarterback to transfer since Pryor's commitment as Rob Schoenhoft transferred to Delaware. The big winner in the all of this could be former Hickory Crawdad Joe Bauserman,who has seen his only competition for the role of experienced backup eliminate themselves from the program. Has any team blown it as badly with uniforms as the Blue Jays? I mean,some teams have had bad uniforms,logos and hats and gotten worse,but in my remembrance no one has went from great to bad in baseball in a long time. Note to the Toronto organization-If you are the Blue Jays,your caps should be blue and your Blue Jay should not look like a chicken. 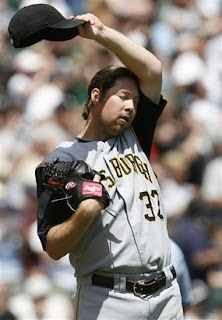 In a game that was well played and exciting for a low single battle,Toronto's John McDonald kicked a Jason Michaels grounder with the bases loaded in the bottom of the 12th,allowing Doug Mientkiewicz to score and give the Pirates a 1-0 win and break a losing streak that had reached three games. Zach Duke pitched very well in his seven inning appearance as Duke was able to match Toronto ace Roy Halladay zero for zero in the run column. Duke had his good curve working and the Blue Jays really struggled with it as they managed just 6 hits off the Texas southpaw. The Pirate bullpen also added five shutout innings of work from Damaso Marte,Matt Capps and eventual winner Tyler Yates (3-0). Pittsburgh had two chances to score runs off Halladay that could have won the game,but Alex Rios easily gunned down Mientkiewicz at home as he attempted to score on a Raul Chavez fly to right. In the seventh,the Pirates loaded the bases with one out,but pinch hitter Chris Gomez fanned against Halladay and Nyjer Morgan smacked a line drive off the temple of Halladay,but the ball improbably bounced to Scott Rolen,who snared it to end the inning. A very exciting game for a 1-0 contest and the type of game that you don't see often anymore. The series continues tonight at 7. The Pirates sent reliever Marino Salas back to Indianapolis and recalled Nyjer Morgan from the I-Tribe. Morgan led off last night and played right field in what may be the weakest hitting right fielder that you have seen in quite a while. Morgan's numbers were less than dazzling for both the Pirates and Indy this year,but the Pirates must have thought that they needed an extra flychaser with the injury to Xavier Nady,who has yet to be placed on the disabled list. Why Morgan over Steve Pearce is another question to be asked as well. The New Jersey Devils were able to add the player that they most coveted in th e first round of the NHL Draft in Ottawa,but were able to do so and add other selections as well. New Jersey added a second round selection for sending their top pick (21) to Washington for their first rounder (23) and a second round selection. 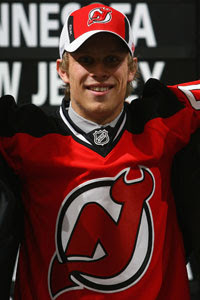 The Devils were not finished yet as they then added a third rounder in the 2009 Draft from Minnesota to move from 23 to 24. The downside to Tedenby is size. He is listed at 5'10,but most say that he is closer to 5'9 and more along the lines of 160 lbs than his listed 175. I do not claim to know the NHL Draft like I do the other sports,but I liked what I heard about Tedenby and really liked what I saw on his highlights. Good fight tonight in Florida,as IBF Middleweight titlist Arthur Abraham battles Edison Miranda in a rematch of their terrific and controversial 2006 battle. 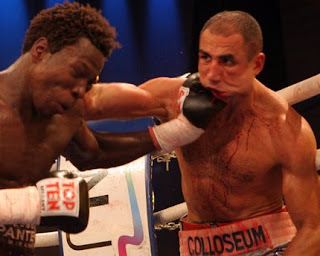 Abraham retained his belt in the bout that was marred by judging that cost the power hitting Miranda three points on the scorecards and left Abraham with a broken jaw that he fought with the entire fight. This bout will be a non-title fight at Super Middleweight as Abraham's belt is not on the line. An Abraham win could cement him a Middleweight title unification fight with WBC champ Kelly Pavlik,while a Miranda win may not earn him a rematch with Pavlik. Pavlik stopped Miranda just before winning the Middleweight gold. In a total toss up fight,I lean slightly towards Miranda,but this truly is a even match that could go either way. The fight is available on Showtime and a special nod to the network for showing the first fight all week as it was not televised in the United States at the time and gives fans a chance to see for themselves what happened. After the success (ha) of last years advice to the Devils with draft day just a few hours away,I figured that it should be about time to roll this version off the assembly line. Please remember that this advice is somewhat flawed as I do not have the Devils exact number of money that they can spend for the big club from the salary cap. 1)Sign a puck moving offensive defenseman. To be fair,this was a toss up between a defenseman and a forward for one of the top two lines. But since this free agent crop appears to be stronger on the blue line,I made this selection. New Jersey is painfully weak on the power play and only Paul Martin really fits the bill of a puck moving defenseman. Rob Blake is available,but at the age of 38,I am not sure that Blake wants to come East and who knows how much tread is left on those tires anyway. Ottawa is allowing 31 year old Wade Redden to walk away and ordinarily I would look at Redden closely. However,the person that I trust more than anyone on Senators hockey says Redden has been horrid for the last two years and that he cannot wait to see him gone. When Ryan Heimberger wants to boot a once productive player out the door-there is a good reason. Bryan Berard would add help on the offensive end,but his defensive play is just brutal. Do the Devils want to give up too much on the defensive end? Bryan Campbell would be a great fit-he's 29 and played most of his career in the Eastern conference,but will the Devils meet his asking price? I might even give Paul Mara a call. Mara is still young at 28,has experience in the area from being a Ranger and signing a blueshirt is always good for a nose honk of the enemy. In case,something has to be done to upgrade this glaring weakness. If Lou Lamoriello prefers to upgrade this instead of the defense,I am fine with that as well. The problem is that the centers are older guys and the wings all have some issues. Mats Sundin is 37,but still playing at a high level,but does he really want to leave Toronto? And if so,would he even consider the Devils? Craig Conroy and Doug Weight are each 36 ,but predominately passing centers and how much would they help wingers that have trouble finding the net to begin with? Bobby Holik is available,but he too is 36,has baggage with the team and does not really provide the needed offensive pop. An interesting name is Josef Vasicek,he is just 27 and although he is not an instant upgrade,I liked what I saw of him last season. The wingers have a few names I like. Pavel DeMitra is the scorer that they need,but he's 33 and very injury-prone. I have always liked Vinny Prospal and wanted him in New Jersey,but it looks like he may return to Tampa. Ryan Malone of the Penguins would be a super fit,but he is going to be wanted by many and will be costly as well. Michael Ryder has fallen out of favor in Montreal and could prove to be a bargain for someone out there. This team needs scoring production,if the Lou can add one player from each of these two columns,I will be one happy fan! The biggest fish that we have to keep is Jay Pandolfo. Pando was playing super on both ends of the ice before his mid-season injury and will be coveted by teams looking for Selke award quality help. I am not sure that this will get done,but lets hope that it can be. I would like to see Bryce Salvador stay,but if the choice is an offense minded blueliner or Salvador,I reluctantly pick the new player. I like Arron Asham,although many Devil fans don't and I would like to see Asham stay in red and black. 4)Sign David Clarkson to a fair deal. David Clarkson,as some of you know,is one of my favorite players. I love his style of play and the hell on wheels way that he takes the ice with. Clarkson is a restricted free agent,so New Jersey will keep him if they want,but the question is do you want to have the player happy or upset? Give Clarkson a fair deal for a few years and we wont have to deal with this for a while. And while you are at it-Brent Sutter,Let Clarkson crash the net more! If he does that,he will score 5 to 10 more goals next year-Bank it! 5)Bring in a cheap veteran defensive forward. This is a help if Pandolfo returns,but it becomes a MUST,if we lose him to another team. An addition with Pandolfo can keep his shifts down and without it-this player must be added to ride shotgun with Madden on the defensive line. This system needs to add offense,if the Devils are going to continue to evolve into the Brent Sutter style of team. The Devils pick at 21 and they need to select a forward or defenseman that has offensive capabilities. This Devil team is not really a young team with a few exceptions and the farm system needs that offensive help! 7)Nicklas Bergfors and Petr Vrana need to be on the squad. It is time for the Devils two closest to ready prospects to be brought to the big team and see what they can do with steady ice time. Both can play center or on a wing (Bergfors left ,Vrana right) and both need to be given the chance to show whether they are true prospects or career AHLers. Bergfors has more offensive potential,while Vrana is more of a pesty type,but both could be productive players next year,if they are given the chance. That covers this years off season advice to the New Jersey Devils. It will be interesting to see how much or little they follow! The Pittsburgh Pirates were an opportunistic bunch for an inning and a half. Nate McLouth saved runs with a tremendous sliding catch to end the Chicago 1st and after Pablo Ozuna threw wide of second on what should have been the second inning ending play,the Buccos put six runs on the board for a 6-0 lead. The lead would not last the Chi-Sox turn at bat as the Pale Hose put up six runs of their own and would take the lead in the third on their way to a 13-8 win and a sweep of the three game set. This was the Pirates fifth loss in six interleague games and facing Toronto ace Roy Halladay next-things are not exactly looking up. Let's focus on the second as that is where most of the damage was done by the Pirates. Adam LaRoche scored on the Ozuna bad throw and Nate McLouth then cleared the bases for a 4-0 lead with a three run double. 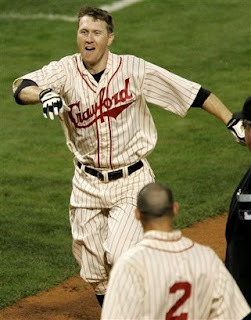 McLouth then scored on Freddy Sanchez's two run clout (4) as the final of the six unearned runs crossed the plate. Sanchez would score McLouth again on a fourth inning single and McLouth would score his third and final run of the day in the final frame on Jason Bay's infield single. In between was 13 Chicago runs,3 homers (2 by Jermain Dye) and 15 hits by the Southsiders. Dye finished with 6 RBI and Orlando Cabrera added 4 runs off his bat for the afternoon. Battlin' Bob's favorite Phil Dumatrait was generally trashed and destroyed in an outing that can be charitably called terrible. The lefty lasted five innings,allowing 9 runs and 11 hits while striking out two in dropping to 3-4 on the season. In the silver lining department-Dumatrait did not walk anyone. Don't say I didn't say anything nice. John Grabow (The Matches nickname could be back soon) continued his downward slide with an awful inning of work that saw him allow 4 runs on 3 hits and walked 2 as well. Grabow has struggled in his last few appearances after a terrific April and May. Sometimes,guys just settle to their level and that looks to be what is happening to Grabow now. What an awful six games to watch. The Pirates return home for the final 9 games of interleague play tonight starting with the Blue Jays. For the few (or one) that cared about my fantasy teams,Gavin Flo yd allowed seven runs,but only one was earned in the perfect scenario for the Pirates and me when they face a member of my teams! Lots of Pirate runs and no damage to the fantasy teams! The Pirates peddled Jonah Bayliss from AAA Indianapolis to the Blue Jays for a player to be named later. I really liked what I saw from Bayliss in Pittsburgh in 2006,but he has not seemed to be the same pitcher since and struggled mightily this year in the Hoosier state with an ERA over 6. 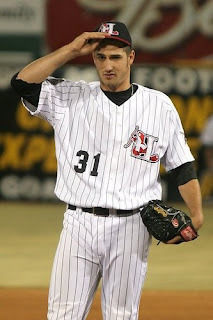 Bayliss was also the pitcher that blew the game that we were at in Allentown by allowing the winning runs to score. I would not bet on getting a huge prospect out of this deal,but anything that you can get for a player that is not in your plans is a bonus. The Tampa Bay Rays wasted no time bringing top overall pick Tim Beckham into the fold with a contract that included a 6.5 million sign bonus. Beckham has been assigned to Princeton of the Appalachian League and will arrive there Sunday before beginning to play sometime next week. In a funny note that would be funnier if I thought this had a chance of happening-the NHL is threatening the owners of the New York Rangers (Madison Square Garden Corp) with being thrown from the league or forcing them to sell the Rangers. This goes back to last season when the NHL took control of all team web sites to put the league more in control of web content and putting all NHL marketing under one roof. Bet on it being resolved,but it sure would be funny if it wasn't! Don Cherry has plenty to say about the Hockey Night in Canada theme leaving CBC and about former Devil Doug Gilmour being bypassed for the Hall of Fame again. 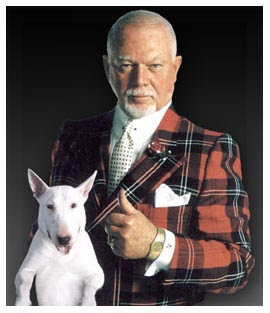 Gilmour was easily a better choice than Glenn Anderson in our opinion. 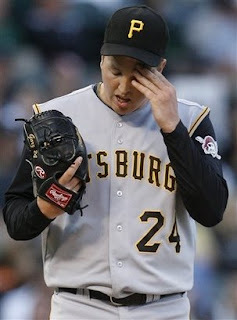 Getting tired of these pictures of Pirate pitchers looking pained? Me too and only half as pained as I am watching this dreck everyday,but to be fair Tom Gorzelanny didnt pitch badly other than the three homers he allowed in a 8-2 pounding at the hands of the Chicago Pale Hose. He only gave up two other hits besides the long balls,but walked 4,whiffed 4 and allowed 4 Chicago runs in a game of 4's for the lefty,but the homers killed him,me and the Pirates. I mean,I can see allowing a shot to Carlos Quentin,he now has 17 of them,but Brian Anderson hitting his 3rd? And Toby Hall hitting his first in over two YEARS!? The game still was close before Tyler Yates continued both his and the bullpens lousy pitching by allowing 4 runs (3 earned) in two innings allowing the Clorox gang to pull away in another laugher. Chicago's Mark Buehrle did not allow a hit until the sixth when Jose Bautista hit his 7th of the season and second homer in two nights. Of course,when the Pirates run Luis Rivas,Chris Gomez and Raul Chavez out as starters,I don't think the 78 Red Sox felt too challenged by that offensive power. Rivas ended the game with the other Pirate RBI,but handed Chicago a run by failing to catch a routine pop up. I always thought utility infielders were supposed to be leather guys first???? To sum it-another awful outing. The series concludes tomorrow afternoon at 2 and that will end the road portion of interleague competition. The Pirates should bounce back tomorrow. Why am I so certain? I have Gavin Floyd on BOTH of my fantasy teams-that guarantees a big Pittsburgh offensive game! Ryan Doumit was sat out of last night's game and will sit out the series finale' in Chicago after suffering a mild concussion in Tuesday's game. Doumit took three fouls off his mask in the game and should make his return in Friday's first game of the homestand versus Toronto. died in Michigan at the age of 51. Jackson won titles at Heavyweight for Oklahoma State from 1976-78 and represented the USA at the 1976 Olympics in Montreal but failed to medal. Jackson tried pro wrestling briefly for Bill Watts in Mid-South Wrestling,but did not last very long for reasons that I do not know. And from the Wow,what a shock dept-Exxon Mobil,BP,Shell,Chevron and a few smaller oil companies will announce that they have earned the oil contracts in Iraq. Of course,earned is a relative term when you consider all of the companies "won" no bid contracts. The one to two year deals are expected to be the first step in larger deals down the road. Leading oil companies from other countries had memorandums of understanding with the oil ministry of Iraq,but were not awarded any contracts. Hmm,anyone think that we (perhaps) have seen just why this war was begun and so many American lives have been lost for???? Tiger Woods announced today that he is finished for the 2008 season in order in have surgery on his knee. Give Woods all the credit for winning the most difficult tournament after two months of not playing the game and then toughing it out with a knee that ended his year for 91 holes. Is Tiger Woods better than the "Golden Bear" Jack Nicklaus? Looking at the numbers,Nicklaus has more career wins (official PGA tour wins) 73-65,but realistically that is just a matter of time before Woods eclipses that mark. Nicklaus leads in Major titles as well (Masters,U.S.Open,British Open and PGA) 18-14,but that too looks likely to fall,but not inevitable. One never knows in a precision sport such as golf. One small hitch could develop in Woods game after extensive knee surgery and he may not be the same player. So,we can project that Woods will end his career with more total wins and likely more Major titles as well than Nicklaus,but was he better? Well,the competition that Nicklaus faced was certainly tougher without a doubt. Of the members of the top ten list of tournament wins-Nicklaus played against 8 of the 11 (Tom Watson and Gene Sarazen tied for 10th),while Woods played against one (Watson),unless you count the largely ceremonial appearances by Nicklaus and Arnold Palmer as playing against. To be fair,Sam Snead and Ben Hogan were past their prime during their years against the Bear,but both still were winning the occasional tournament,especially Snead. One must go down to 13th to find a Woods contemporary-the enigmatic Phil Mickelson. I consider myself a Phil fan,but every time that it seems that he has put it all together as a player to truly challenge Woods,something goes askew and the challenge never seems to arrive. Lets go outside the top ten and add players that had a Hall of Fame type career that for various reasons are not in the top ten wins list. Woods has Mickelson,Vijay Singh(the master of the small tourney),Ernie Els and David Duval,who look to have a career similar to Johnny Miller and that is pretty much it. To me,the final piece to the competition puzzle is this-Nicklaus had 19 seconds in Majors to add to his wins,Woods has just 5. Woods is regarded as a tremendous finisher when he holds the lead and deservedly so,but who is he holding off? Usually it is the Rocco Mediates of the world not his tougher competitors,they usually are in mid-pack having conceded another tournament. We will never know who truly was the better player as Golf does not apply to stats as well as other sports. 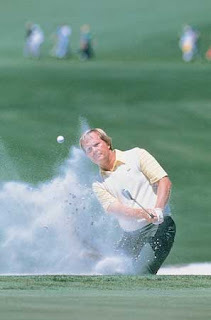 Players do not play in every tournament and a great season is a handful of wins,but in the end,if you were able to put a prime Jack Nicklaus against a prime Tiger Woods for a 20 tournament "Season" head to head-I'll take the "Golden Bear" to win more than he loses for one final reason. Woods simply loses his emotions too much to not have that backfire against great opposition. He gets away with it now,he would not against Nicklaus. Downloaded the new Firefox 3 browser and like it a lot! My only problem is this-the saved items in dropdown menus are no longer in alphabetical order. That I wish I could change. Part one of a two part interview with Jay Larkin is a very interesting read on MaxBoxing. Larkin formerly was the person in charge of making the fights on Showtime and Larkin offers his thoughts on how Boxing has downslid from its days as a stalwart of Network TV. You are preaching to the choir,Jay-I have been saying this for years! Part two of the interview talks about how things could change and its possible network return. What is it with Chicago?? 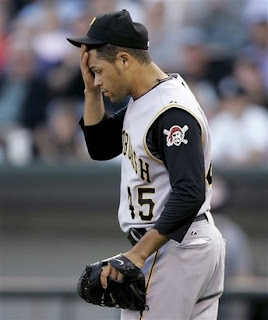 The Pirates continued their futility against Chicago teams with an embarrassing 16-5 loss in Chi-town to the White Sox. Ian Snell was chased after 5 innings and 7 runs in falling to 3-7,but his bullpen "help" was even worse. Franquelis Osoria and Marino Salas combined to allow eight runs in just two and a third and Sean Burnett allowed 1 run in an outing (1 and two thirds of an inning) that epitomized the term-"Mop Up". As hard as it must be to believe from a 16-5 loss,there was a point that this looked like a good night for the visitors from Pennsylvania. After the Chi-Sox scored a first inning run,the Buccos roared back with 4 runs in the visitors half of the second. Jason Michaels doubled home both Adam LaRoche and Ryan Doumit and shortly thereafter was singled home by Doug Mientkiewicz for a 3-1 lead. Mientkiewicz would score to conclude the Pirate runs at 4 as he tagged and trotted home on a Nate McLouth sac fly. The White Sox tied the game in the third off Snell,but the Pirates tied the game again in their next at bat on Jose Bautista's long homer to left (6). The game was all downhill after the Pittsburgh fifth,as Chicago would score runs in each at bat from the fifth until the games end and when that happens you have a lopsided game. 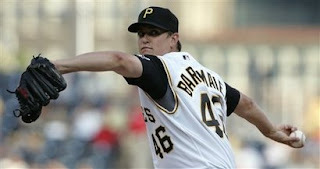 Once more,this showed the Pirates glaring weakness in long and middle relief. Pittsburgh simply has to rely on mediocrities like Osoria far more than an average team should and that is how nightmares like tonight happen. Don't get me wrong,I am not advocating making trades yet to improve middle relief,but trying to get the point across that bad teams have some really bad pitching and this team has to bank on bad pitchers performing better than their abilities. The series continues tomorrow at 8:11,lets hope the game is better than this. The Pirates brought their third and fourth rounders into the fold with the signing of shortstops Jordy Mercer and Chase D'Arnaud. and Matthew Hague could comprise the starting infield at State College. Either Mercer or D'Arnaud could see time at second for the Spikes and a fast start for either could make them Hickory bound to reduce the logjam,while time at first base for Hague would not be a surprise to me to avoid splitting time with Farrell at third. The Spikes lost their season opener to Jamestown,but 12th round pick Calvin Anderson did blast a three run homer in his pro debut. The 6'7 Anderson should be the main first baseman,but Matthew Hague could see time there as well. The Cleveland Indians quickly signed their top pick,Lonnie Chisenhall,to the bottom line and assigned the former Pirate draftee to Mahoning Valley. Chisenhall received a 1.1 million dollar bonus and will be the Scrappers starting shortstop,but will be moved to the hot corner in instructional league play. The Indians also signed a name from the past in former All-Star Morgan Ensberg and sent him to Buffalo. Ensberg was recently released from the Yankees. It is hard to believe how fast a player can fall-just three years ago Ensberg hit 36 homers for the Houston Astros. Former Devil Igor Larionov finally got his deserved election to the Hoc key Hall of Fame today. 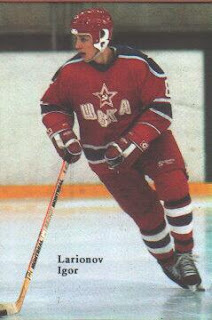 If you went strictly by NHL numbers,Larionov would have been a borderline selection,but when you consider his prime years were spent in international play-he is a slam dunk entry. Wish I could say the same for the other inductee-Glenn Anderson. Sorry,but I do not think Anderson measures up. His stats look impressive,but he played in the highest offensive era in the history of the sport and was playing with arguably the greatest forward ever in Wayne Gretzky for most of his strong seasons and when Gretzky left Anderson-Anderson's stats went with him. The Hockey Hall simply has too many good players in it. The Hall should be for great players. Look for a Devils related post sometime this week with off season advice. The coverage of the passing of NBC News Bureau Chief Tim Russert was both stunningly complimentary of him and difficult to explain as why one reporter was glorified as such a deity at the same time. He seemed like a guy that was a lot like myself, with a great interest in sports and politics along with being a strong family person and his work was excellent. Russert's Meet the Press was a must see for the political junkie and the casual observer of the scene. His weekend program on MSNBC and earlier on CNBC was a must tape every weekend for me and in many ways,I enjoyed it even more than Meet the Press. His questioning of guests was tough,but fair and those questions came to those from both sides of the batters box unlike some from the left (Olbermann) that refuses to have right leaning opinions on their programs or from the right (O'Reilly),who invites opposing views only to not allow them to speak or to belittle any opinions that are not similar to theirs. Tim Russert was not a screamer and certainly did not come off as shrill by any means,again unlike many of the political commentators of today. His love for the Rust Belt town of his youth (Buffalo) mirrored that of my own and his support of the city of Buffalo was very laudable. I have always held those that had not forgotten where they came from in high regard,it is so easy for anyone to forget humble beginnings when one is enjoying the crest of success. So before you read the following,keep in mind that what you read is not about Tim Russert. The coverage by MSNBC was over the top,overdone and frankly not always in the best of taste. I watched some of the programming that was shown,but in fairness-I had seen much of it before. I find it incredibly difficult to believe that the only thing newsworthy in the world for a 72 hour period was the passing of a newsman. An incredibly talented newsman and well liked newsman,but again there are so many other stories and events out there that seemed to be put on hold by the NBC family while NBC saluted Russert leaving those that were looking for more than a look back at the life of Tim Russert from their news network of choice. Since the weekend was looming,a proper decision could have been made by running a crawl on all NBC and MSNBC coverage that CNBC (since the stock market closes for the weekend) would be showing Russert related programming as a tribute to their fallen comrade. That move could have satisfied all viewers looking for all things. I understand that the loss of Russert was a huge shot to the department of news at NBC both as a business and personally to his co-workers,but was it necessary for the war,the presidential election,oil issues among many to placed on hold for the weekend to hear what seemed to be everyone from Tom Brokaw on down to the guy that filled the water cooler pay tribute? 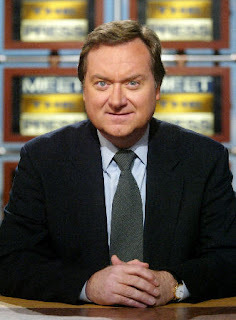 As a MSNBC viewer,it seemed to be too much and that is before the canonization of Russert. Russert loved his son and both were an important part of each others lives,but was it newsworthy to hear this 25 times an hour? Funny,how it was never mentioned that Russert pulled strings to earn Luke his weekend radio show on XM (satellite) radio talking about sports with James Carville. I don't bring this up to disparage Russert,he did what most of us would do-anything to help the people that we care about,but he was flawed. I grow more and more disenchanted with the news networks. Too much celebrity,(CNN),too far on the left (MSNBC) and too far on the right (Fox). Why cant we just talk about what happened and let us read what we think into it. I have no problems with opinion based shows,but it seems that we are falling into the trap of biases leeching into the news portion of the programs and that is not a good sign. I would love to see Brian Lamb and C-Span jump into this with a Joe Friday style of news-Just the facts and figures without an agenda to set. Tim Russert was a large loss to NBC and the news industry in general,but the passing of Russert may have done something else. He may have shown the power of celebrity outweighs the duty of informing. Somehow,I don't think that is what Tim Russert stood for in life. For a look at Bag of Health's take on this-click here. Back later with the Pirates visit to Chicago and other news. The Pittsburgh Pirates did it again in being unable to hold two different leads in the final two innings and as a result dropped another game to the Orioles in Baltimore 8-7. 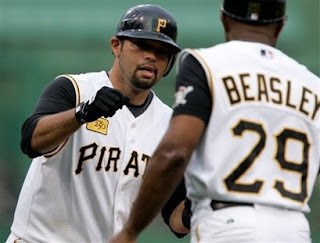 The Bucs received early homers from Xavier Nady (10) and Freddy Sanchez (3) to keep the team in the game,but Jose Bautista's three run shot in the seventh (5) turned a two run deficit into a one run lead. John Grabow then allowed two runs in the Oriole seventh to allow them to regain the lead. After a super start to the season,Grabow has recently begun to revert to "Matches" form. But in the 9th,Adam LaRoche ,of all people,slammed a two run bomb into the seats (7) off Baltimore closer George Sherrill to give the Pirates the lead and just three outs aw ay from a win. But Matt Capps (0-2) could not hold things together either as someone named Oscar Salazar took Capps over the wall and as the inning progressed,Ramon Hernandez finished the game with a shot to the gap to score Freddy Bynum. This loss really hurts and not just because it was another loss to the Orioles. I could marginally understand the Friday loss,this team has real problems in long and middle relief,but last night-2 of your three best guys got you beat and that is a knife to the heart. Zach Duke pitched passably in the start,well enough to keep things close anyway. Things actually got worse for Pittsburgh in the ninth as Xavier Nady looked to have injured his leg on a foul hit by Hernandez shortly before the Baltimore backstop ended the game. Nady was forced to leave the game and was replaced in right by Jason Michaels. Do not look for Nady to play today and if so as the DH. The Buccos look to avoid the sweep today at 1:35. I am not sure if there will be a post tomorrow as I have to work my regular shift and then do 4 hours of medication classes before I get to bed in order to then work Monday night. An interesting read from the Post-Gazette on the at tendance problems of both the Pirates and the Indians. Pittsburgh's problems are pretty simple. They are a losing franchise and losing teams will struggle at the gate especially in a town that has two other franchises that are winning ones. The Indians are a bit different as they have been a solid team for most of the last decade plus. To me,the Indians issue is this-even though they are a good team,their stars lack personality and the team comes off as dull. This is a big problem for a team in a city with LeBron James in it. A quick bit of Fathers Day wishes to my dad and all of the fathers out there. And finally,if you have a few minutes to kill,this will help me out. Ryan and Battlin Bob have gotten me into a sim football league,where you create players and they play games etc. You build your players abilities with points earned through performance,but I can also gain them through referrals. So even if this looks to be something totally uninteresting to you,if you have a few minutes-sign up and help me out making my beginning players better-I would appreciate it! Here is the link and you must cut and paste it into your browser and you have to use the URL listed or I will not gain points. The Pittsburgh Pirates looked to be finally approaching the level of mediocre (.500) that seems to be such an obsession to Pirate fans (not me),the organization and the Pittsburgh media with a 6-1 lead against the awful Orioles,but then the clock hit midnight. Phil Dumatrait started walking batters,as he is prone to do, and allowed the Orioles to get back into the game and Franquelis Osoria finished the job (3-2) by relinquishing the lead. Sean Burnett then added the final toppings in a 9-6 loss in Charm (Ha!) City. Dumatrait avoided taking the loss although he certainly gave put a team that was flat on their back back into the game and put the middle relievers in a position to have this game not end well. Bad team usually have poor long and middle relief and the Pirates have those in abundance. When this team finally turns the corner,one underrated reason will be that they will not have to continue to hand the ball to the Franquelis Osorias of the world and expect them to pitch well when the track record indicates that they will not do so. After the Orioles scratched out a first inning run off Battlin Bob's favorite lefty,Pittsburgh took the lead in the second on a two run single by Jack Wilson. In the next inning,Doug Mientkiewicz singled Jason Bay home and that set the stage for Jason Michaels to clout a three run shot (3) and a 6-1 lead. Things were looking good to the point that the MASN announcers (Creature Feature Thorne and Comatose Palmer) were talking to the members of the 79 Orioles that were there instead of worrying about the game. I swear I saw more of Doug DeCinces than the playing field one inning! But then Dumatrait started walking people and walks turn into runs very quickly as results from walks turned into runs in both the fourth and fifth leaving Dumatrait staggering from the game after 5 innings with a less than impressive line-5 innings,5 runs,5 hits and 5 walks. Only in the strikeout column was Dumatrait short of 5 with just three. Osoria then allowed 2 runs in the sixth to give Baltimore the lead and Sean Burnett allowed a run in each of his two innings for the final score. A disappointing night and one that the Bucs gave away. The series continues tonight at 7 by the Inner Harbor. I watched the game on tape,as Battlin Bob and I traveled to Frederick to see the first half champions of the Carolina League,the Potomac Nationals battle the Keys. Potomac walked away with a 5-2 win despite the Keys loading the bases in the ninth to set up an exciting ending to the contest. The signing was great as I was able to get get every player that I needed on Potomac to sign their cards from the 2008 Disabled Veterans (team giveaway) set and the seven players that were in the Hagerstown set to sign. We sat beside the family of Potomac pitching coach Randy Tomlin and it was quite enjoyable to sit with knowledgeable fans that root for the opposition (Like us!). Both of the Tomlin children were into the game with lots of cheering,but not overbearing at all as can happen sometimes. One can clearly see that the Tomlins have done a excellent job raising their children as they were quite the class act. A Hagerstown note as well from the game-A players wife (or girlfriend.not sure) that sat in front of us told me that she had been telling her Potomac counterparts about how bad Hagerstown was. She said "not the city,the facilities and that no one comes to games". 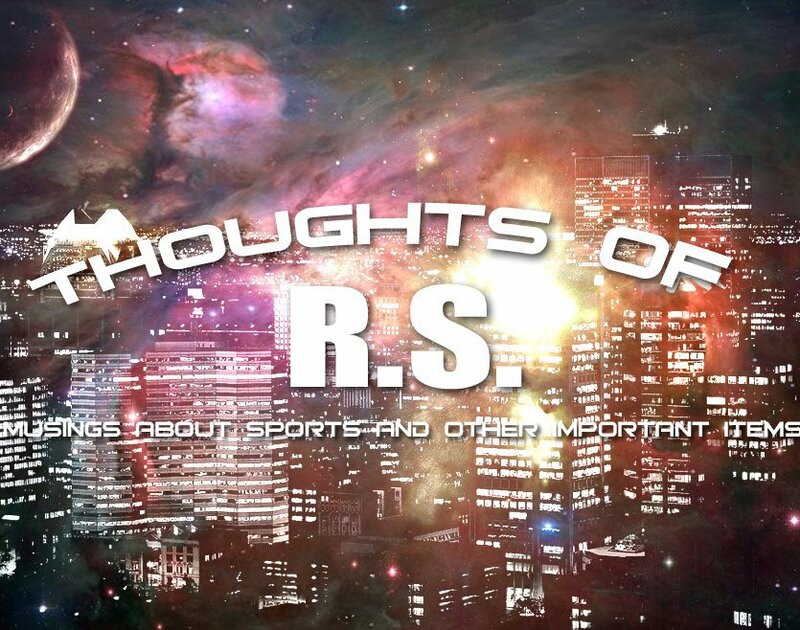 I only thought of then that it must be difficult for the players to perform well considering the facilities and the all the other stuff that entails the team and and began to think of the players that were just Ok here and the first time that a player moves up,they play better at the higher level. Cory Van Allen and Carlos Gomez are just two that jump to mind like that immediately among others. FTR- I know which player is her significant other,I just don't feel comfortable naming him without permission. 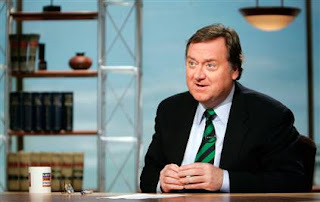 A brief note on the passing of Tim Russert. I was a loyal watcher of both Meet the Press and his weekend show that started in CNBC and moved to the more logical network MSNBC last year and I have always thought that he was fair minded and was not afraid to ask the tough questions. Watch for more on Russert on Tuesday when it is looking like a slow day. I think you will enjoy this one. Battlin Bob sends us this sad word on the passing of Charlie Jones. Jones was ,to me, one of the top voices of the AFC games as the play by play voice of NBC's number two team in the 70's and 80's and did other sports as well. Jones had a real handicap in his last seasons at NBC,he had arguably the worst and most annoying analyst ever in Todd Christensen and had to carry him every week! I liked Jones for his honesty. Jones called a race in the 1988 Olympics and called the wrong runner all the way through the race and when that runner won,Jones went into the usual post race Olympic ramble that is always done after any Olympic event. When the mistake was discovered-Jones quickly announced it,admitted the mistake and threw no one under the bus-"my mistake,Nobody elses". I have never forgotten that-accountability. I am sure that I will be ranting about the MASN/Orioles team sometime over the next few days,but this time I am going after the Pirates. Baltimore spent the extra dough to wear 1979 caps and jerseys for the series against Pittsburgh and even though they were ugly it was still pretty cool to do and the Pirates should have matched their efforts and worn their 79 versions for the visit. Marty Brodeur won the Vezina Trophy last night for the fourth time in being recognized as the leagues top goaltender at the award announcement last night in Toronto. Brodeur's four Vezinas rank second only to the recently retired Dominik Hasek (Six wins) on the Vezina list and this one may be the most deserving one of the four. Evgeni Nabokov of San Jose was deserving as well,but having watched Brodeur in action all season,this might have been his best year. The Devils are far from the most talented team and the Devils playoff season (and near Atlantic Division title to a vastly more talented Pittsburgh team) can be accredited to Marty and his play. Lately the knock on the Devils has been their playoff exits (2 second round and this years opening round),but what the Devil haters just don't realize is the talent gap between New Jersey and many of the teams in the conference-some of which the Devils still finish ahead of! That difference maker is Marty Brodeur and here is to more great seasons and more Vezinas. It certainly will be different watching Devils hockey when Brodeur skates off to the Hall of Fame. The Big League Stew blog is doing a series on each ballpark in baseball and used the best as their first post in Pittsburgh's PNC Park. PNC got 85 % A grades and the article covers the ballpark,the city and things to do in the area as well. 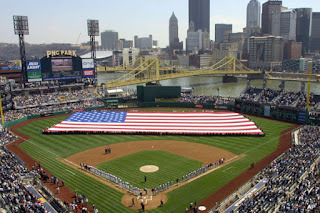 The picture of PNC from opening day shown here is from the article. Very interesting and Cleveland's Progressive (Jacobs) Field is the next in the series. Stumbled on a site filled with pics from the old Richfield Coliseum. I have been looking for something on the Coliseum this comprehensive for quite a while! The author does not allow use without permission even if given credit,but it is quite good and I love the background music from the Michael Stanley band! Now for some pics of my arena haunt-the Capital Centre! And finally,the Hamilton Tiger-Cats started their pre-season play with a 12-10 win over the Winnipeg Blue Bombers. Timmy Chang (Hawaii) led the Cats to their winning score in the 3rd quarter. Hard to believe that CFL football is here already! Ryan Doumit hammered another homer in the first inning t o stake Pittsburgh to an early lead and the Pirates held on for a 7-5 win over the Washington Nationals on a getaway day at PNC Park. The blast was the ninth for the lefty swinging catcher and his fourth in the three game set against Washington. Tom Gorzelanny earned the win and leveled his season record at 5-5,despite his velocity still seeming to be lower than it should. Gorzelanny allowed 3 runs on 6 hits,struck out 6 and walked three in his term and walked himself in the Pirate 2nd,which resulted in an RBI for the pitcher. Nate McLouth then added a 4th Bucco run with a sacrifice fly that scored Chris Gomez to result in a 4-0 Pittsburgh lead. Washington scored a single run in the third,but that was washed away in the Pittsburgh fifth when Jason Bay scored Gorzelanny on a sac fly and Doumit added a third RBI to his total when his single plated Nate McLouth. Gorzelanny was chased from the game in the 6th as he allowed 2 runs and Sean Burnett allowed a run in his first appearance in what seems to be forever. The play that may saved the Bucs was an Elijah Dukes single,which scored a run and moved Christian Guzman to third,that Dukes attempted to stretch into a double and was thrown out by a mile by Xavier Nady from right. If Dukes stays at first or is safe at second,who knows what would have happened,but instead the Pirates held onto a 6-4 lead and each team scored single runs in the eighth for the final score. Jason Michaels pinch hit double resulted in the final Buc run. Damaso Marte pitched the ninth in the place of the overworked Matt Capps to click up his first save of the season. The Pirates travel to Baltimore tomorrow for a three game weekend series against the Orioles in the beginning of the interleague slate. Now that the Nationals series is over,only one more opposing team announcers to tolerate. The downside is that is this weekend vs Baltimore. The Nationals announcers are quite good as I have always liked Bob Carpenter and Don Sutton is good in the color chair,but for the Pirate series Sutton was not around and was replaced by Mr.Nancy Lopez (Ray Knight) and his work is not favorable in my opinion. The Orioles commentators are far worse as they have four of the most annoying around with "the screamer" Gary Thorne,smarmy Buck Martinez,catatonic Jim Palmer and funnyman (in his own mind) Jim Hunter. It looks like a LONG weekend unless I use the mute button. The Cleveland Browns released center LeCharles Bentley after two practice sessions. Bentley asked for his release as he believed he would have a better chance to play elsewhere after his two seasons off after his devastating knee injury in 2006 training camp. From the way that the press release read it looks to be a amiable parting from both sides. Here is another article on the best play by play man in Hockey-the Devils own Mike"Doc" Emrick. Last week Emrick threw out the first pitch before a game at PNC Park and the diehard Pirate fan talks about both hockey and his Pirates obsession in the review. Until tomorrow when I have no idea what I will write about,so likely will be a theme post of some kind. Doumit strikes again in 3-1 win! 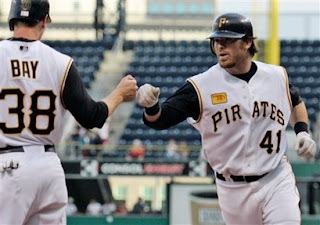 Jason Bay's first inning double gave Pittsburgh a lead that they would not surrender,but the bigger stories in the Pirates 3-1 win over Washington belonged to Ryan Doumit and Ian Snell. 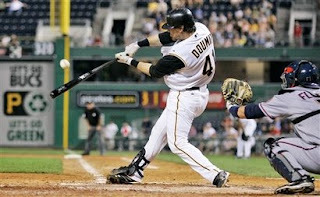 Doumit followed up his 4 for 4 day on Tuesday with a 3 for 4 night in this game including a homer (8) that was crushed to deep left center,which is the deepest part of b eautiful PNC Park. Doumit continues to show the abilities that could eventually make him the elite catcher (Batting wise) in the league. Snell,on the other hand,won his first game in 11 starts with a 6+ inning outing that saw the Nationals score just one run off the righthander and that in his last inning of the evening. Snell walked three,but did strike out six and has now fanned 15 in his last two starts and that bodes well for a possible return to form. Matt Capps added a 16th save to his season total in his 4th appearance in four days-With today being a day game,I would doubt on that streak reaching five. I watched the game on MASN replay (one advantage to them playing Washington) because I went to the Hagerstown-Lakewood game. The Blue Claws took a 7-3 win behind Julian Sampson's excellent start allowing one run in six innings in his second start since a stint on the disabled list. Some of you may remember Sampson as a pick of our in last years shadow draft. The Suns play the next four games on the road to end the first half before the all star break and then starting the second half home schedule the way they ended it-vs Lakewood. Hagerstown also released their 2008 team set last night and I was pleasantly surprised by the look of the set. I liked it quite a bit and a massive improvement over the 2007 version. The Pirates signed 4 more draftees and the quartet includes the highest pick to sign thus far and one of the most intriguing (to me at least). 7th rounder Benjamin Gonzalez is a shortstop from Puerto Rico and is the highest pick to sign,while 15th rounder Chris Aure is a pitcher from Alaska! Not a large amount of Alaskan pros,so I am looking forward to Aure in the future. Both players passed on college commitments to sign-Gonzalez with Oklahoma State,while Aure turned down a JUCO offer from a school in Arizona. If you click on the links for Gonzalez and Aure,they will take you to the top notch site of Wilbur Miller and Wilbur has already looked at the 2008 draft. I wholeheartedly encourage you to do so! I have talked to Wilbur about an interview here and he agreed,now all I have to do is get off my rump and get it done! The move has not made yet,but Marino Salas is expected to be recalled from Indy and Bryan Bullington returned to the Brickyard. Bullington was brought up 2 weeks ago and has yet to make an appearance. The Post-Gazette reports that John Russell is reluctant to use Bullington or Sean Burnett in tight situations. Seems to me that he is reluctant to use them in ANY situation. Back later with the matinee game report! Gopher balls shock Bucs 7-6! Things looked good in Pittsburgh for quite a while as Ryan Doumit had powered two homers (6 and 7) and Paul Maholm was one bad pitch away from a shutout. But just when you think things are good,Lucy jerks the football away and in the 7th inning,Maholm allowed three solo homers in 4 batters to tie the game at 4. That set the stage for Lastings Milledge to blast a two run shot off Matt Capps (0-1) with two out in the Washington ninth to give the Nationals the 7-6 win. The blown save for Capps was the first in 16 opportunities and comes in his 3rd outing in 3 days. One could make an argument that maybe someone else (Marte?) could have been given this one,but perhaps John Russell figured that this one just could not get away and he wanted his best guy even if it meant short rest. Pittsburgh had taken a one run deficit and turned it into a one run lead in the bottom of the eighth with two runs off Washington relievers. Xavier Nady's single scored Jason Bay and Doug Mientkiewicz hit a sac fly to score the tagging Ryan Doumit from third to put the Bucs in a position of needing just three outs for the win. A great night for Doumit-4 for 4, 2 homers,2 doubles and 3 RBI. If he can just keep healthy,the Bucs have the rarity of all rarities-a power hitting catcher that hits for average as well. The downer of the game besides the loss was two homers for Washington's Ronnie Belliard. I cannot stand him from his days in Cleveland! I missed posting on the previous days 5-3 win over the Diamondbacks to salvage a split of the four game set. Zach Duke pitched well (6 innings 2 runs) improved to 4-4 and if he would not have to had to face Mark Reynolds,his numbers would have been even better! 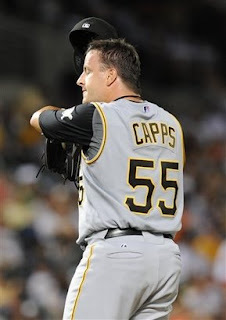 Matt Capps earned save 15 and Bucco RBI went to Luis Rivas,who had two and one each to Jose Bautista,Xavier Nady and Jack Wilson. 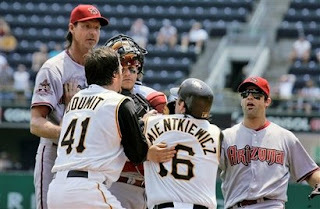 The biggest news of a rather dull game was the dustup between Randy Johnson and Doug Mientkiewicz. There was not much to it and truth be told,in baseball fights there usually isn't much action,but a little flareup is always fun. Both "combatants" were more than ready to throw the mitts,but again as is usually the case-AFTER the game,in the clubhouse talking to the press. Author Eliot Asinof died yesterday at the age of 88 in Hudson NY. Asinof was the author of the seminal work on the 1919 "Black Sox" scandal with his 1963 book Eight Men Out and was an advisor on the 1988 film of the same name. The article on his passing mentions his other books and his being blacklisted by the McCarthyites "red hunt" in the 1950's. Eight Men Out will always be the top book on the 1919 World Series as when the idea came to Asinof to write the book,some of the person involved were still alive and he was able glean information that otherwise would have been lost to the ages. I could not give a higher recommendation to anyone interested in that part of baseball history. Long time Vancouver Canuck Trevor Linden retired today after 19 NHL seasons,16 of those were spent on the Pacific Coast with the Canucks. Linden was never a superstar,but a solid player and a popular player in Vancouver. My favorite Aunt,Becky sends us this note on the approval of some of the funds needed to renovate Cleveland's League Park. League Park was the initial home of the Wahoos and has become run down with only a portion of the outfield wall and ticket booth still standing. Here is an article from last season from the Indians themselves talking a bout the future of the historic field and our post on the renovation from almost one year to the day! I have always wanted to go there and snap some pictures,but frankly everything that I have heard about the neighborhood deterred me a bit. I would like to have a rental to drive away from the area in and the reports that I read indicates that as a definite maybe!! League Park also has a new group of defenders as the League Park Society was created last month. This is a tremendous site that gives you all the information that you could want on the Park and why such an important part of both Cleveland and the Indians history needs to be preserved and rehabilitated. 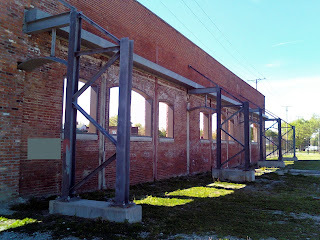 The above pic is part of the eroded grandstand from the LPS site and the site has several other pictures from the area. I get asked sometimes,since I have such a passion for the Cleveland Indians,why they get short shrift here compared to the Pirates. The simple answer is this,I like the National League game better and I find myself watching more Pirate games than the Tribe versions. Tonight will be the last Hagerstown Suns home game of the first half,so I will be there and attempting to finish off a few of the Lakewood Blue Claws for the collection as well. Plus it is another chance to see the Phillies terrific young prospect Dominic Brown,who I was very impressed with in Lakewood's earlier visit.